Legitimacy of Yves Rocher case against Navalny brothers to be reconsidered | Russian Legal Information Agency (RAPSI). MOSCOW, May 6 (RAPSI) - The Moscow City Court overturned a lower court's decision validating a claim by cosmetic giant Yves Rocher's Russian operation against opposition blogger Alexei Navalny and his brother Oleg, RAPSI's learned in the courtroom. The case has thus been remanded to the lower court. The Navalny brothers stand accused of having embezzled 55 million rubles ($1.8 million) and illegally laundering money obtained through the transport of Yves Rocher Vostok goods. 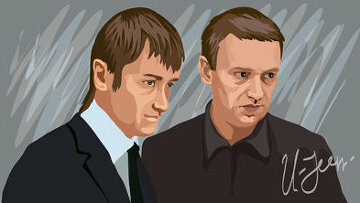 In December 2012, the Investigative Committee described the charges pending against the Navalny brothers as follows: "Oleg and Alexei Navalny embezzled over 55 million rubles from a trade company... In order to legalize the illegally obtained funds, the Navalny brothers transferred over 19 million rubles ($322,130) under false pretexts from a fly-by-night company to an account belonging to the Kobyakovo Willow Weaving Factory, which was also founded by the brothers." Over time, information surfaced that the trade company being referred to is the Russian operation of the French cosmetic giant Yves Rocher. The enterprise transported mail from August 2008 until May 2011. While the real cost of the transportation amounted to no more than 31 million rubles ($1.02 million), over 55 million rubles were transferred to the agency's account for transportation services allegedly rendered. According to Navalnys’ lawyer Olga Mikhailova, none of the documents submitted by the investigators prove her clients' guilt. This is a civil dispute between the companies, she added. Alexei Navalny, an opposition figure and an anti-corruption blogger, is also a suspect in a timber embezzlement case. According to investigators, from May to September 2009, Navalny, who was serving as a voluntary adviser to the Kirov governor, organized the theft of over 10,000 cubic meters of timber from the Kirovles company in collusion with Vyatka Timber Company Director Pyotr Ofitserov and Kirovles CEO Vyacheslav Opalyov. 17:34 06/05/2013 The Moscow City Court overturned a lower court's decision validating a claim by cosmetic giant Yves Rocher's Russian operation against opposition blogger Alexei Navalny and his brother Oleg, RAPSI's learned in the courtroom.